(Bloomberg) – John Bogle, who popularised the low-cost index-based mutual fund as founder of Vanguard Group Inc. and insisted that most stock-picking money managers weren’t worth the fees they charged, has died. He was 89. By word and example, Bogle proselytised on behalf of patient, long-term investing in a diversified group of well-run companies. He focused his advocacy on index funds, those that buy and hold the broadest mixes of stocks. He cautioned that the pursuit of quick trades and short-term profits typically helped investment advisers more than investors. 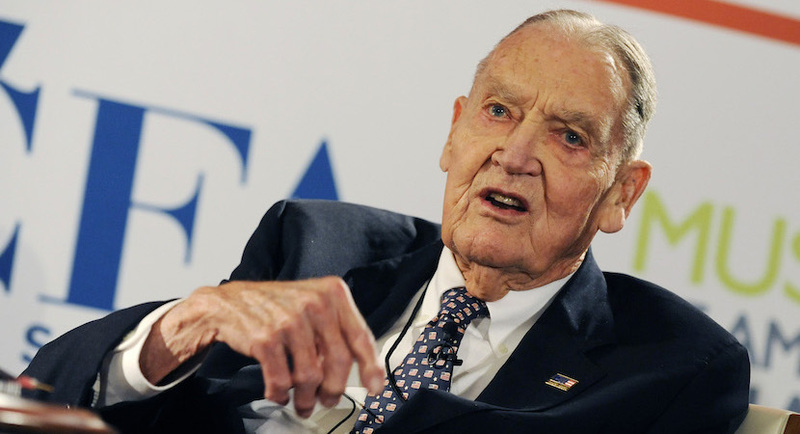 Bogle’s formula turned Vanguard into the largest US manager of stock and bond funds. Bogle founded Valley Forge, Pennsylvania-based Vanguard in 1974. Investors attracted to its low fees helped the firm overtake American Funds, managed by Los Angeles-based Capital Group Inc., in 2008 as the biggest US stock and bond fund manager. Vanguard has $4.9trn in assets under management. Initially greeted with skepticism, the Vanguard 500 Index Fund, an unmanaged portfolio of the stocks represented in the Standard & Poor’s 500 Index, has more than $441bn in assets. A related fund, Vanguard Institutional Index Fund, has $221.5 billion in assets, according to the company. Another Vanguard index fund, Total Stock Market Index, had $672bn in assets as of Dec. 31, 2018. When Bogle retired from Vanguard on Dec. 31, 1999, the company established the Bogle Financial Markets Research Centre. He served as president and continued to speak and write about the need for reforms. He told Bloomberg Television in December 2008 that the US government’s bailouts of companies including American International Group Inc. and Citigroup Inc. had “deeply discredited” capitalism. At a February 2009 congressional hearing, he warned that the US retirement system “is imperilled, headed for a serious train wreck.” Months later he filed a brief with the US Supreme Court siding with investors who were challenging fees charged by fund managers. Investors everywhere should take a moment to remember the late John Bogle: we all owe him a debt of gratitude for changing the investment landscape. RIP John Bogle. Forever a legend in the investment space, basically inventing low cost and passive investing. He disrupted the industry in a very positive way. Bogle remained chairman of a separate oversight board of the Wellington funds, whose members were loyal to him. He persuaded the board to relieve Wellington Management of responsibility for administering the funds – tasks that included shareholder record-keeping, fund accounting and preparing public filings – while continuing to oversee management and distribution. Mutual funds, Bogle said, should be independent from the companies that manage their investments.